Florence was kind of nuts, and we had been warned so we were expecting it, but still… bonkers. We got up pretty early and caught a train from Siena to Florence, hit some kind of delay on the train and arrived late, into a very hot and crowded city, where we hit the ground running, rushing off to the Accademia Gallery, because we had some expensive timed-entry admission tickets. There was a spectacularly long line for admission and quite a security process to get in. We saw Michelangelo’s David, which was big and kind of impressive but also surrounded by such a crazy throng of admirers. And since I took lots of art history classes in college, I’ve seen a LOT of pictures of David already, so it wasn’t incredibly new and exciting for me, but OK, those hands are something. We browsed about the gallery and then had a surprisingly difficult time trying to figure out how to get out of it again, though we did enjoy getting lost in a beautiful exhibit of musical instruments. We finally found the exit, reclaimed my dad’s pocket knife, which had been seized at security, then made our way out through the crowds to the streets and set off in search of Trattoria Mario, which had been recommended for lunch. But of course, when we found it, the line for lunch was wayyyy too long so we had to go for a touristy (though very tasty!) lunch at the next place that had an open table. It was actually a nice peaceful spot to rest and watch the crowds go by. Then, off again to meet up with my sisters. 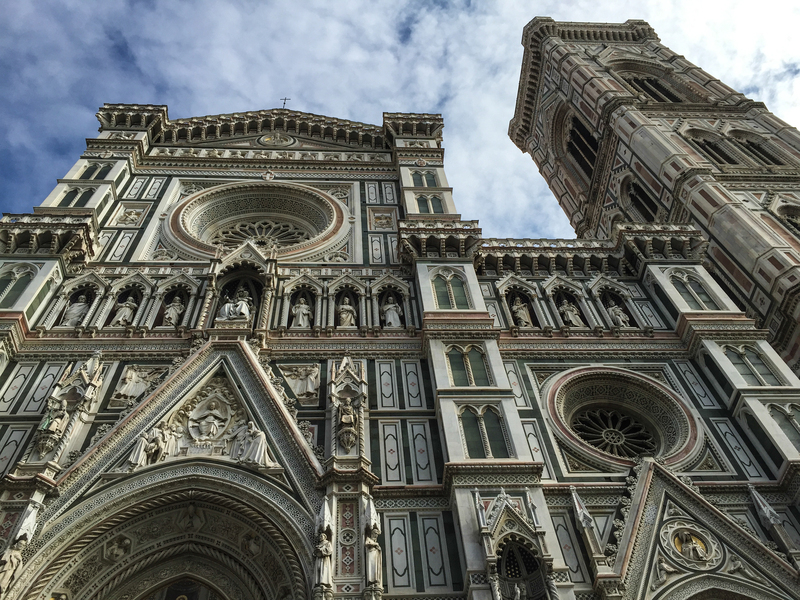 The streets were increasingly crowded as we approached Il Duomo, and then… there it is! Huge and excessive and beautiful and crazy. I would love to go in, and climb up to the amazing dome, if I’m ever back here again. 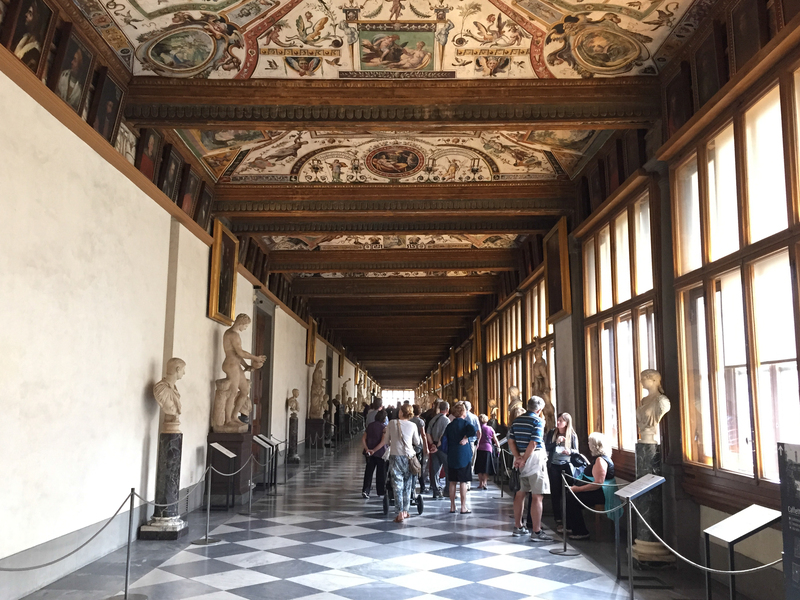 But instead, we continued on to meet up at the Uffizi Gallery. Again, lots of standing in line to get in, but it seemed worth it once I made it up to these wonderful corridors filled with sculptures and decoration. The rooms were filled with beautiful paintings that were familiar from Art History 101. 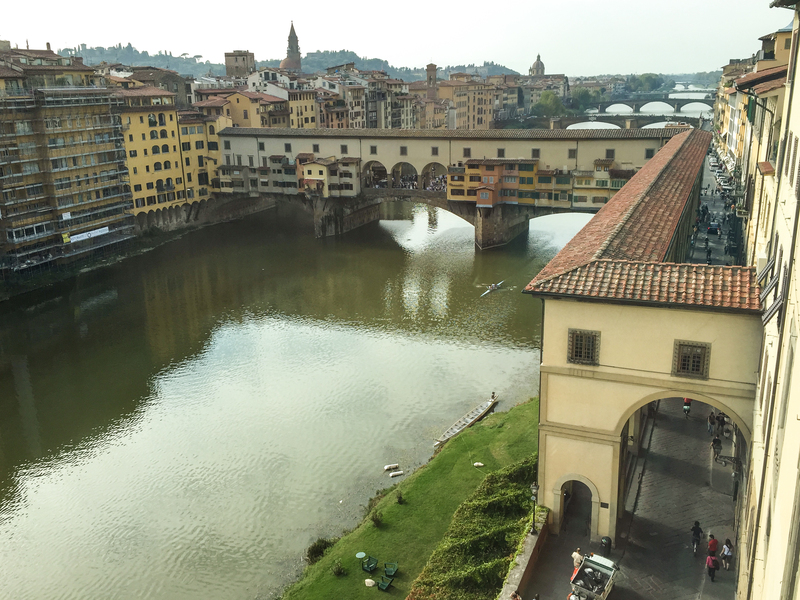 And I loved the views out over the Ponte Vecchio. 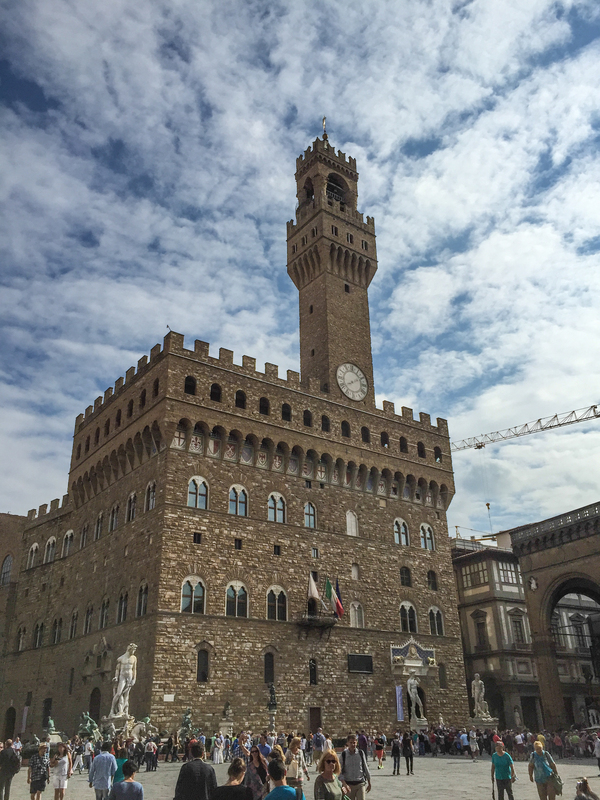 We took a lovely gelato break at the rooftop cafe, with close-up views to the upper level of the Palazzo Vecchio, which was neat. And then it was already time to hurry back to the train and head home again. I feel like Florence really is a beautiful city, but SO crowded with sightseers that it was hard to appreciate it thoroughly. As a former New Yorker, I’m not afraid of crowds, but I feel an irrepressible twitch of irritation towards tourists (even when I am one!) and it feels more like visiting an amusement park than visiting a real city, if most of what you see is the backsides of the tour group in front of you, and if every view is partially obscured by the view screens on all the cameras that are waving in front of you. If I’m ever lucky enough to come back here again, I might want to come during the winter and hope that things are a little quieter, and definitely take a few days to see more things at a slower pace. Still, it was neat to catch a little glimpse of the city. 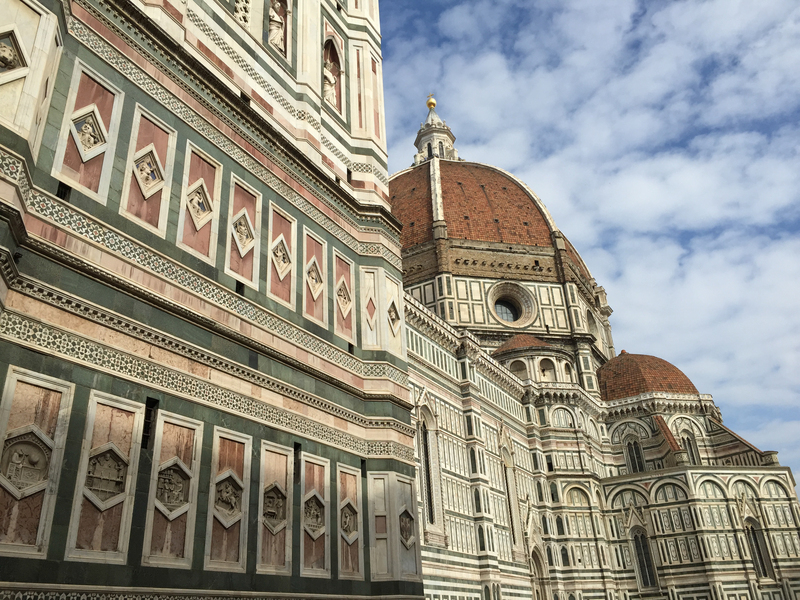 I imagine there’s so much more to Florence than what we caught in one quick day. 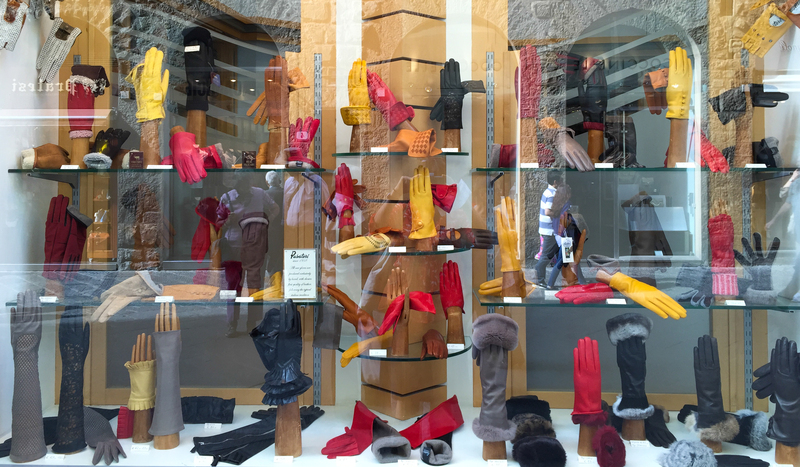 Loving all the shop windows here, especially this glove display!